We weren’t planning to release a Holiday Tea this year. Instead, we thought we’d spend the Holidays the usual way – drinking leftover Carävan and Earl Grey, racing RC helicopters, and ranking slow jam videos. But lo, our designers were possessed by the spirit of the season and knit us these incredibly “tasteful” labels. We couldn’t resist creating a custom blend of delicious tea to stuff into a cozy tin. Sure, they’re a little itchy and the fit is a bit old-fashioned, but it’s the thought that counts, right? 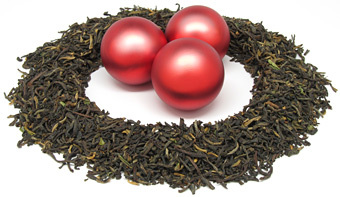 The Damn Fine Holiday Blend is a one-of-a-kind blend of black teas. No, it’s not flavored with anything but pure, delicious tea. It’s full-bodied and bright, tastes great with or without milk, and is especially awesome with cookies. Brew it for four minutes in boiling water. True to its name, this is truly a Damn Fine Holiday Blend. While other companies are busying themselves with flavoring their teas with cranberries, cinnamon and other what-nots, the geniuses behind Andrews & Dunham’s Damn Fine Tea (um… I guess that would be Andrews & Dunham, eh?) created a Damn Fine blend of tea leaves that tastes so remarkable, that it doesn’t need flavoring. It has plenty of delicious flavor on its own. It has a whisper of sweetness that is sort of like burnt sugar caramel… sort of like honey… but then again, not quite like either of them. It is intriguing and delightful. I also love the smoky quality of this tea. It is JUST RIGHT for me – I am one that typically does not care for overwhelmingly smoky teas (Damn Fine Tea’s Caravan is an example of one that I found just a little too smoky for more than occasional enjoyment). But this has just enough smokiness to interest me without being off-putting. I’ve tried several teas from Damn Fine Tea now, but, I think that this one is my favorite. It is truly delicious! And as of this writing, this limited edition of just 200 tins of tea is half gone! I may just have to get myself another tin before it disappears! I think I’m still waiting for mine… or my husband intercepted it and hid it. I admit I’m a little nervous about the smokiness, but it sounds good! Hi Cody! Smoky teas make me very nervous too, and I am generally not a big fan of smokiness. It’s quite off-putting for me, and for the longest time, I couldn’t even have Lapsang Souchong in the HOUSE much less brew a pot! I couldn’t even handle the smell of it. Since that time, I’ve come to have an appreciation for a little bit of smokiness but I still don’t like a strong sense of smoky flavor. The amount of smokiness in this tea is very slight, and to the fan of smoky teas it might be quite difficult to discern. Since my palate is sensitive to it, I can taste it, but, because it is so slight, it is not off-putting but instead offers an interesting dimension to the tea. I look forward to hearing what you have to say about the tea when you do receive it!